When you wear anything other than a supportive, reliable shoe for walking or standing long hours, you can easily set yourself up for pain and injury to your feet, ankles, and legs. The best walking shoes for men are ones that maintain their shape despite long wear, support your arch and ankles, and provide the right curves for your foot shape. 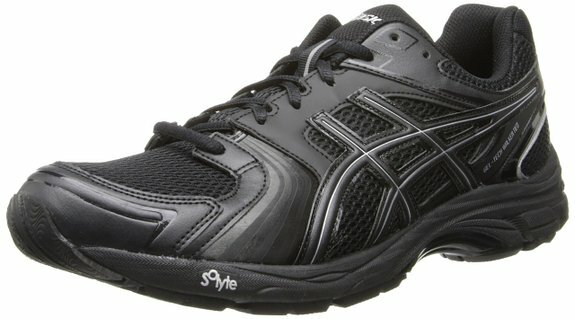 Our picks for best walking shoes for men hit all the right marks for your walking feet. Below, we’ll outline the 5 best walking shoes for men based on several criterion and highlight what we like about each pair as well as their drawbacks. The GEL-Venture 5 is suitable for both walkers and runners, with a sturdy rubber sole with extra material in high-wear areas, like the heel. These shoes have an interior gel cushion which you can remove, if needed, to wear a medical insole for better arch support. With a lace enclosure that ties going up your arch, your ankles and feet will have plenty of support as you walk. 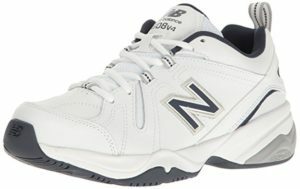 New Balance Men’s Training Shoe is one of the most popular for walkers. The dual-layer foam padding provides support on the bottom layer with a top cushioning layer for all-day comfort. These shoes also have an internal shank that helps them keep their shape while supporting the joints and promoting proper foot alignment while walking or standing. 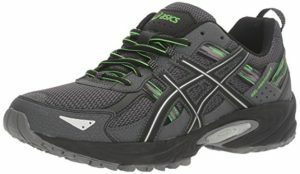 Asics Men’s GEL-Tech Neo 4 may be a good choice for those looking for a lightweight option for footwear that also stands up to daily, consistent wear. These shoes have breathable mesh panels to help air circulate and whisk away moisture with an internal liner to prevent germs and odor. The gel cushion on the heel and toe provide extra comfort when you’re on your feet. Merrell Men’s Helixer Distort Walking Shoe offers a unique blend of a comfortable, casual shoe with the ruggedness of a hiking boot. Since it’s made of leather and textile with a quality rubber sole, this shoe can get you through all types of weather and terrain while maintaining its shape and keeping your feet dry. A unique heel cushion absorbs shock from walking. And, the mesh lining of the shoes is designed for odor and moisture control. If you’re looking for a casual-looking, slip-on shoe, the Skechers Performance Men’s Go Walk 4 may be a good choice. With no laces, these shoes are easy to slip on in a hurry and offer a stylish design that’s unique for walking shoes. These shoes are one of the most breathable pairs, with a mesh lining that allows for good air circulation. The comfortable insole pushes back against your every step to support your joints and arches as you walk. When you spend decent money for a quality pair of walking shoes, you expect them to last for a long time. But, durability is important for more than just a price tag. The durability of your walking shoes directly affects the support they give you. Walking shoes should hold their shape well, even after long days of wear and tear. If your shoes wear down on the soles or around the ankles, you can put yourself at risk for injury. Proper arch support is essential for any shoe, but it’s crucial if you spend a lot of time walking. The arch support in your shoes can absorb shock from walking that could cause pain in your feet, ankles, and knees. The best walking shoes for men will provide quality arch support for many types of arches, with the ability to comfortably wear high arch insoles if necessary. Additionally, your walking shoes should provide adequate ankle support to reduce the risk of twisted ankles or improper foot placement when walking. Your shoes should provide comfort throughout a long day. Our choices for best walking shoes for men can give you long-lasting comfort through design and padding, while also allowing air circulation to prevent wetness and odor from long wear. These other important factors may influence your decision for the pair of shoes to purchase. Terrain and climate are two important things to consider before making a shoe purchase. Rough terrain, like rocky surfaces, may require a thicker, more durable sole than shoes you would wear to walk on grass or sidewalks. If you walk through various types of weather, a waterproof sole is a must. Take time to look at sizing charts and measure your feet before you make a purchase. If you have wide feet, you should consider shoes with wider widths, as a pair without the proper width can damage your joints and cause severe pain.